The leading independent specialist for windscreen replacement and windscreen repair based in Chester and serving all of the Chester area. National Windscreens Chester fitting centre provides windscreen replacement and windscreen repair services to businesses and individuals throughout Chester and the Chester area. The city of Chester lies north of the River Dee in the county of Cheshire. Chester is close to the Welsh boarder and the M56 provides access to the east of the city, while the M53 provides access to the North West and Liverpool. The A51 and A56 provide access to the city centre which saw vast expansion during the Industrial Revolution as a result of a comprehensive construction programme that included railways, canals and new roads. 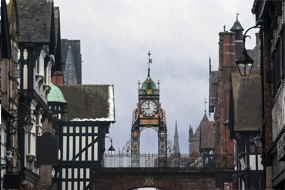 Chester boasts a number of historic medieval buildings as well as some of the best preserved city walls in the UK. The Chester windscreen fitting centre and its mobile vehicle glass technicians service the needs of Chester and the surrounding area including Wrexham, Northwich, Crewe and Whitchurch. With 108 fitting centres and over 800 mobile technicians, National Windscreens operates the UK's largest windscreen repair and windscreen replacement network. The company provides low cost, high quality windscreen replacement and windscreen repair from its Chester fitting centre 24 hours a day, 7 days a week, 365 days a year. Repair and replacement of all types of vehicle glass including windscreens, rear windows and side windows is undertaken throughout Chester and all of the Chester area.